This is where the rails start or end depending on your direction. I have not been here in a while, but there are rails running across this bridge and they have put board walks on either side of the rails. I am not sure if the train crosses the bridge now or not. It used to stop just before it to turn the Steam Train around while the passengers enjoy the view. This bridge has a couple of interesting facts about it. 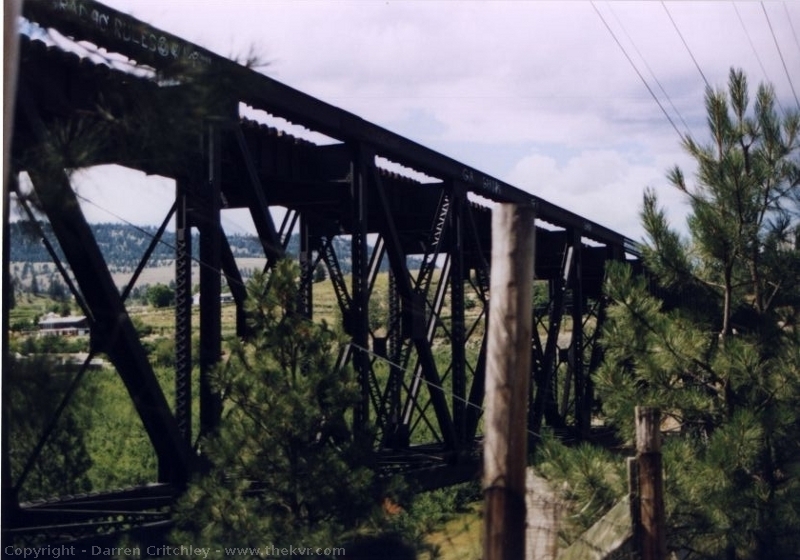 It is the highest bridge on the line at 250 feet(73 meters). It is also the third largest of its type in North America. When I took this pictures, there was no handrails or fence on the bridge, I understand that some people are still squeamish about crossing this one, even with the handrails on it. Unfortunately these pictures do not do this bridge justice. 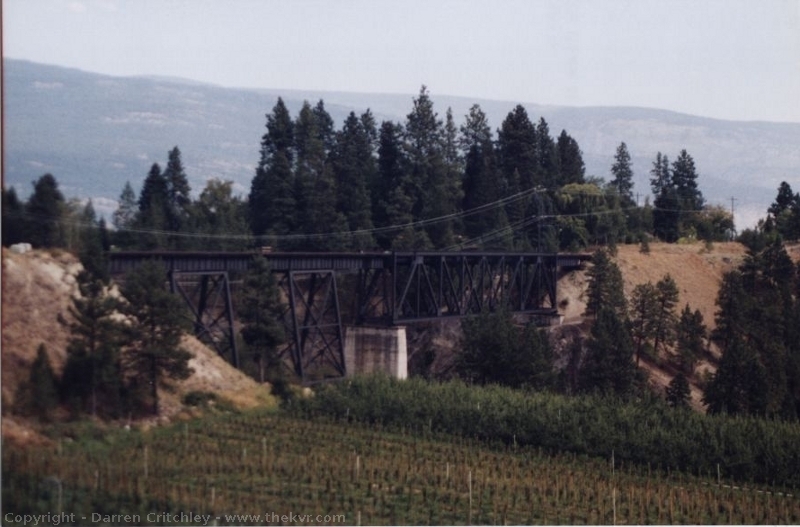 I have seen a picture of the inaugural run of the Kettle Valley Steam Railway on this bridge with the engine and two cars and it still doesn’t reach end to end on this bridge. There is a very nice view of the valley from this bridge. You can just make out Okanagan Lake in the background. 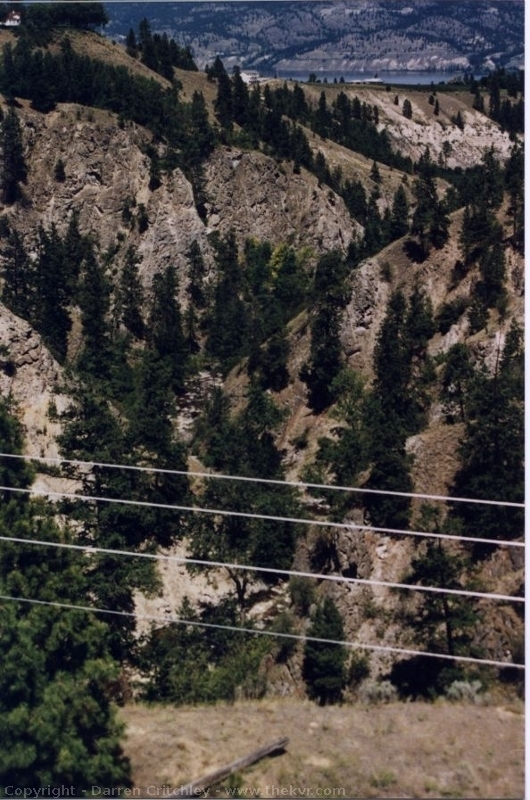 I did take a shot of the gorge below, but it is really hard to tell the distance or anything from the image. Access to this bridge is via the Agricultural research station.